The contemporary critical environment found in hospitals, laboratories, vivariums and biological containment facilities require accurate efficient and verifiable monitoring and control. Technology and innovation allows modern facilities to use air delivery systems that lower air volumes, automate sequences, reduce static pressure requirements and truly measure air flow. With intuitive user interface devices, open logic controllers and closed loop technology we verify that every CRC system is actually delivering what it supposed to. Today Critical Room Control is the leading innovator of safe energy efficient critical environment solutions. 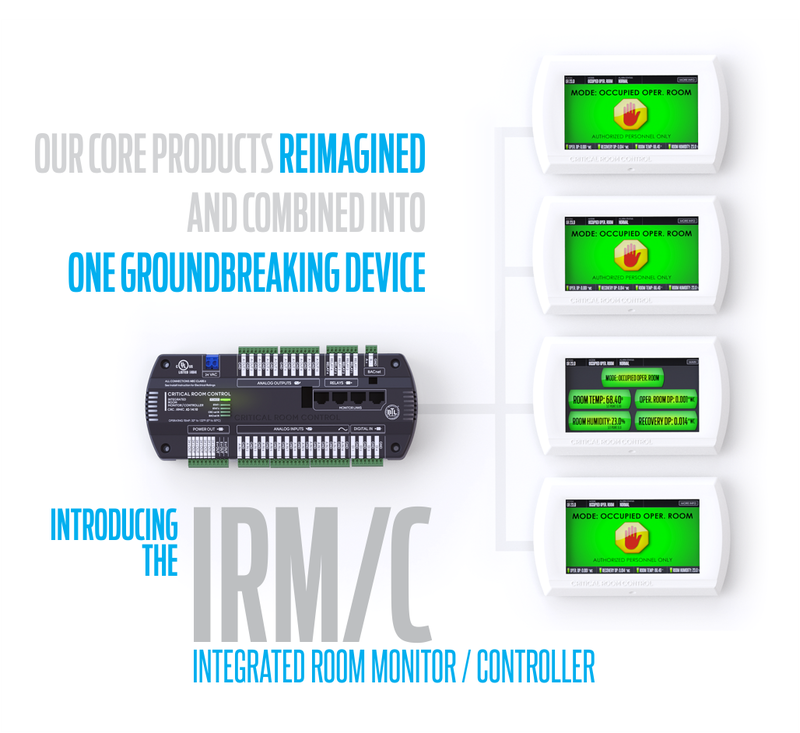 CRC announces the product launch and release of the revolutionary Integrated Room Monitor / Controller (IRM/C). The IRM/C product combines the functionality of our RPM/C, LPM/C, MultiVIEW, and MPC devices into one powerful device that can support up to four touch screen monitors. With the swipe of a finger, users have streamlined access to a feature-rich room pressure monitor, a MultiVIEW Monitor displaying up to 28 points, and an advanced I/O board that can be easily configured to control any space application. Press Release: CRC releases industry changing closed loop venturi air valve model CRC-CLV ? Technology and innovation has lead to the development of the Critical Room Control CLV (Closed Loop Valve). Designed for critical environments that adhere to stringent ventilation requirements where it is imperative to verify that desired operating conditions are being met. The CLV?s energy efficient design eliminates high static requirements, limited operating range, and 1960?s style mechanical plungers found in traditional systems. When facilities with critical spaces require verifiable systems - CRC is one of the few companies that can respond with ?yes we do actually measure what we control?. Press Release: CRC releases the CRC-FHM and CRC-FHC (Fume Hood Monitor/Controller) the Industries first full color fume hood controller capable of supporting direct velocity, volumetric (Vertical & Horizontal sash) and constant volume hood configurations. The monitor's on board PID loop can control the CRC-CLV (Closed Loop Valve) to maintain proper face velocity or volume. The FHC can operate as a standalone controller or part of complete Critical Room Control system. 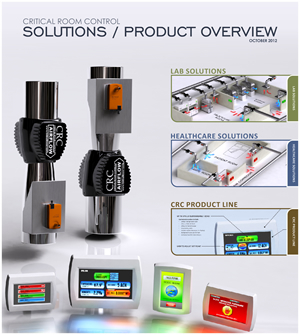 Critical Room Control is your single source design and manufacturer of superior critical environment airflow monitoring and control systems for the medical, laboratory, and life science community. We are known for our ability to integrate solutions into an easy to use management system. We pride our company on developing and using the latest technology to create a safer and more efficient working environment. Who trusts CRC to control and monitor their critical spaces? Our mission is to develop new products, incorporating the latest technologies to create a safe and efficient working environment. Our products improve the health, safety and efficiency of facilities worldwide. Critical Room Control allows the user the unique ability to customize any critical space with a simple touch of a finger. With CRC with our powerful critical room controls offer an easy to understand and navigate interface. Personnel can quickly view an entire facility or an individual environment. Having access to facility information expedites the ability to react and make critical decisions that affect the safety and comfort of patients and staff. We offer all of this information and much more with a simple touch of a finger. Critical Room Control systems include intuitive user interfaces that clearly indicate current status while automating proper space use and proper ventilation designed for critical environments that adhere to stringent ventilation requirements where it is imperative to verify that desired operating conditions are being met. CRC innovative control logic is capable of delivering uncompromised safety while maximizing energy efficiency. CRC's turnkey Life Science solutions deliver unequaled cost effective critical control while maximizing energy savings and occupant safety. Our open logic controls and automated sequencing allows staff and researchers a much improved working experience. CRC's Lab solutions offer a reliable, efficient, and flexible environment that ensures research integrity. Just like the research work being performed inside the laboratory space the CRC closed loop control strategy verifies actual operating conditions are being met. Our integrated local user interfaces allow access to critical environmental information important to their research with a touch of a finger.